Click here to view the complete program. "Anthropocene: Arts of Living on a Damaged Planet" begins Thursday evening with a talk by acclaimed science fiction author Ursula K. Le Guin at the Rio Theatre in Santa Cruz. The talk has long been sold out, but simulcast video streaming will be available at two locations on the UCSC campus: the Humanities Lecture Hall (Room 206) and Social Sciences 1 Room 110. 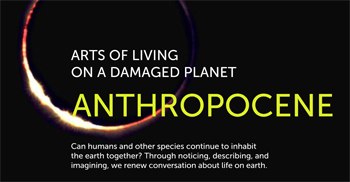 The talk and broadcast are scheduled to begin at 7 p.m.
"Through noticing, describing, and imagining, we renew conversation about life on Earth," is how organizers describe the conference's objectives. Le Guin spoke of her views on the subject in an extensive interview with the Good Times weekly newspaper. "Well, we’re at a point where how many species go extinct everyday due to human interference? How many oil spills are we going to have? How many people are running around shooting school children with repeater guns? Things are not going well," she said. The conference was conceived by UCSC anthropology professor Anna Tsing and is co-presented by the UCSC Anthropology Department’s Emerging Worlds initiative and Denmark's Aarhus University Research on the Anthropocene project. The term Anthropocene is a new one, used to describe the geologic epoch defined by human disturbance of the earth’s ecosystems. Last year, Tsing won a $5 million Niels Bohr Professorship from the Danish National Research Foundation with which she is establishing a program encompassing the humanities, natural sciences, social sciences, and the arts in an exploration the Anthropocene. Aarhus is Denmark's largest and second oldest university. Founded in 1928, it is located about 120 miles west of Copenhagen. Tsing spent last fall quarter at Aarhus and will teach and conduct research there during the 2014-2015 academic year. She spent time at the university in 2010 on a Guggenheim fellowship. The conference will continue Friday and Saturday with series of talks that are free and open to the public. All will be held at the Colleges Nine and Ten Multipurpose Room on the UCSC campus. A complete schedule can be found at anthropo.ihr.ucsc.edu.